Wondering how we are doing??? You might be wondering why I am not updating my blog often anymore... The reason is simple: I am out of time... When I have a minute to myself, I take a nap (which is well deserved by the way!). Alexandre is doing well with school... MathUSee completed with other math books, French in books and Rosetta Stone, Typing Tutor, even English. He takes the time to read more and more even at church during worship and the words being on the screen. I'm proud of him. I'm proud of myself... even though there was some days where I was REALLY discouraged. Last week was hard. Trying to motivate him while he wasn't feeling too good. Fortunately, I had some good friends who encouraged me. I am preparing slowly but surely for the arrival of child #4. I removed all the games that were in Jérémy's wardrobe (only the puzzles left now!) and even think of potty training him... At least he is used to sit on the potty or the big toilet even though it is quite rare that he does his pee there. I want to be done my Christmas shopping before the end of November as I won't have the energy or motivation to do it after that... If only we could find a good desk for Jérémy's room so that I can put back the one in the baby's room so I can organize the baby clothes. Alexandre is also doing chores more and more... This morning, he even took care of the breakfast of his brothers while I was dealing with something else with my husband. Impressive! This week is take it slow week... Alexandre has croup somehow but he still can go to gymnastics today. He is really excited about it. So we are taking it slow. Yesterday he was not feeling too good so we did only a lesson of Math U See Alpha. We filled the humidifier for the night and today he is doing better. Still coughing though but better than yesterday. So we did some more maths today but this time in his Reader Rabbit book and we revised shapes but 2D and 3D ones. This afternoon is gymnastics so Jérémy is having his nap this morning. I woke them up at 630am this morning, we had breakfast then off to the chiro and Wal-Mart to complete our boxes for Operation Christmas Child. Life lesson this week is about blessings the poor. We are making 6 boxes this year as we will be 6 in the family by the time Christmas arrives. Yep! It looks like my c-section will be before Christmas so baby will be with us at home on Christmas day. I should have a confirmation on the date next week when I see my ob (which by the way has the same first name and last name as my husband... no kidding!). Right now, Alexandre and Dominic are doing puzzles and playing with a game that has shapes to fill in some pictures. As I said, we are taking it slow since Alexandre is not feeling top shape... When he speaks it is as though he will loose his voice. ... We already have swimming on Thursday nights. Now we will have gymnastics on Wednesday afternoons. Just learned about it two days ago... It started early October so we missed three lessons but we got a prorated price because of this. It is organized through the homeschool association in my area. Somehow, I didn't get the e-mail back in September to announce this. Got it on Tuesday night. I was very disappointed so I contacted them. So starting next Wednesday we are having a new schedule!!! We got the glasses!!!! Dominic is all happy about it. Here's what he looks like. It doesn't show much but the glasses are blue and the side of them are brown. Click here to hear the radio ad for H.E.A.T. Worship House Event! 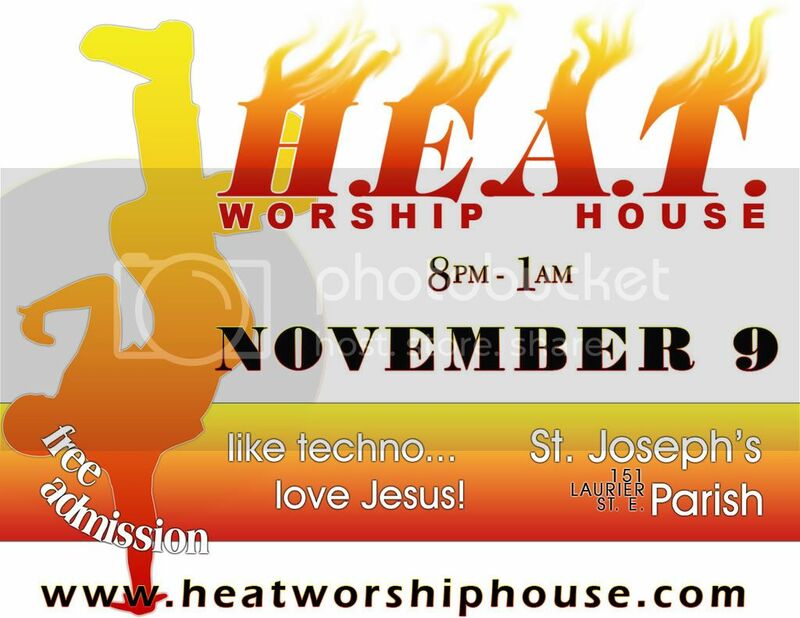 Check out the website: www.heatworshiphouse.com ! Anyhow, we met the specialist a gentle man who explained to us that Dominic had strabismus but that it didn't affected his vision so no patches... Two options: glasses or surgery. His strabismus is not very bad... only 1.75 on both eyes while there is cases worst than him. So we are going for glasses for now at his recommendation and then check if it helps. Last resort would be the surgery... I pray that we avoid this option as much as possible but I know he is in good hands. So we got a price for glasses at the clinic but we wanted to shop around. There is would have been 226$ for one pair of glasses. We went at two other places. First one was about the same price... so this was not an option. Then we went to Costco. They didn't have a lot of choices but there was one pair that seemed to be nice on him. To top it off, there was a coupon that week for when you get another pair of glasses it would be 60$ rebate on it. So we got two pairs for 140$ believe it or not... If one pair breaks then we have a spare right away... Same model... no fluffy thing for a little 3 year old. Now when we get them, we will have to make sure he wears them as much as possible... which means training. He needs to understand that glasses are fragile. I promise to post a picture when we get them!!! ...being judge about something that you know is totally untrue? How have you reacted? It frustrates me like there is no words for it. I want God to always remind me how I felt so that I will not this to someone else. This week is a slow week in homeschool... First we had a trip to visit my mom on Monday. It has been ages since we went down. It took some convincing to be able to go down but I think we had a good time. Today is homeschooling... We did some French reading and I am pleased to say that Alexandre is doing well in this area. We also did some Maths. And they did some K*Nex construction after lunch. Right now, Alexandre is helping Dominic with the computer... Dominic loves to play with it too! Tomorrow, we will do homeschool again but then on Friday we will do what we can because we have an appointment for Dominic with an eye specialist. The poor kid has a lazy eye which goes inward. So we will know what we need to do to correct this on Friday. Will he have glasses or a patch??? Right now I am letting the bread machine preparing the dough for pizza... Pizza! Homemade.... Mmmm! Delicious! During the week-end we had supper at my in-laws and we went down to see my mom on Monday. The day was good I think... But we shall see in a week or two how it will come back... We never know. I don't feel good this morning... Dizzy and bizarre. Headache too! With Jérémy I was borderline when I did this test... Maybe this time I am over! Last week-end we decided to surprise the kids! It was homeschool week-end in a way since we went to two field trips in Toronto... First stop the zoo! All that time they thought we were lost to get to the trailer (ha ha)... when we got to the zoo at 9am on Saturday oh boy! what joy they had. It was a great time... if only Jérémy would fall asleep when he is tired though... but no this little one want to see everything. After a day at the zoo we surprised them once again by bringing them to Chuck E Cheese. A first in our family but oh FUN FUN FUN! We will go back for sure. The kids loved it especially our oldest... Now I am wondering if this is a christian company because they passed a Veggie Tales song on the screen. Anyone knows??? The next day, we drove back home but before we went to the Ontario Science Centre to spend a couple of hours there. We were able to go free because we are members of some museums in our area which are part of a network around Canada and the States. It was fun again and the kids were able to explore different things. Check out some of our highlights of the week-end below!! !